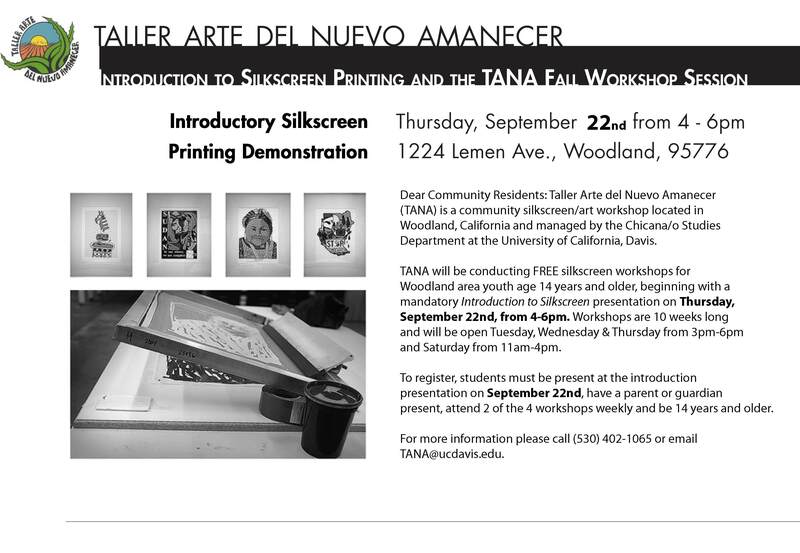 This email is to announce the Fall 2-11 Screenprinting Workshop demonstration and schedule for Taller Arte del Nuevo Amanecer (TANA). Taller Arte del Nuevo Amanecer (TANA) is a community art center located in Woodland and managed by the Chicana/o Studies Department at UC Davis. TANA holds community silkscreen printing workshops for community youth and residents. The workshops are focused on encouraging the exploration and representation of culture as a means to empower and encourage self-determination. For anyone interested in participating in the Fall Session please attend the Introductory Silkscreen Demonstration that will be held at TANA on September 22nd from 4-6pm. Please see the attached flyer or visit our blog (tallerartedelnuevoamanecer.wordpress.com) for more information and please feel free to forward this information to interested youth and community members.